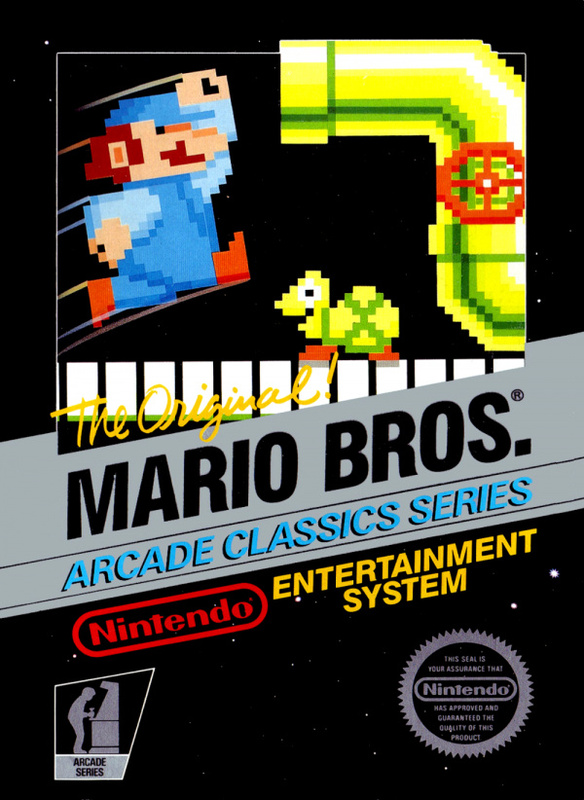 Plumbers Mario and Luigi must dispose of all the critters coming out of pipes in the action-packed arcade game that initiated the most popular video game franchise of all time. 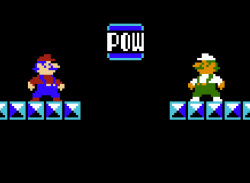 Two players can cooperate and compete in one of the first multiplayer hits of Nintendo. 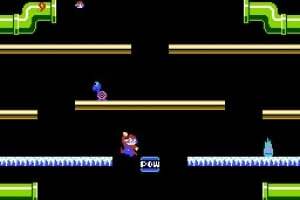 As its title suggests, Mario Bros. marks the first appearance of Mario's brother Luigi when two players compete together. The game also introduces several staples of the franchise. 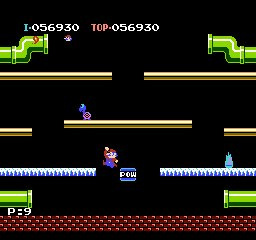 Mario is now a plumber (instead of a carpenter in Donkey Kong), faces turtle-like enemies and can collect coins in bonus stages. However be careful, it is not yet possible to directly jump on enemies like in further episodes. Find a way to make them inoffensive beforehand. i got this game, man i love the multiplayer action though, very competitive! me and my roommate tore this sucker up all day soon after i got it. he is still beating me in the highscore singleplayer aspect of the game though but i will get more than 240,000 points, you just wait! 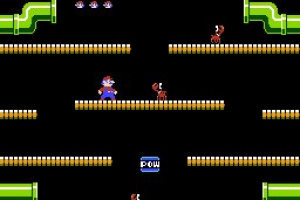 Personally, I think Donkey Kong and Donkey Kong Jr. are more fun than this game. However, I've never played this game in Vs. mode. This game is only really any fun in Vs mode IMHO. The race to steal the coins before the other player can get them is part of the fun and adds to the enjoyment. It's not a bad little game, just don't expect wonders. The game's a lot of fun. Download it. And yeah, two player mode is great! If I want to play a single screen two-player type game like this, it'll be Bubble Bobble I'm afraid. So where is the VC version of Bubble Bobble Nintendo? Hmm? Ok well just like a lot of other nes games, I would never download this game for two reasons. 2. A lot of my game boy games have this game built into it. This is definately recommended for 2 players. 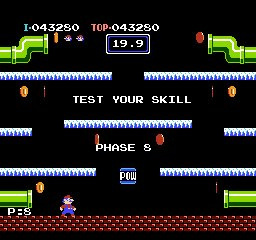 One player only will get bored - the levels repeat after Stage 15 or so. Back in the day it was one of the best multiplayer games. I remember playing this for hours with my brother. It's designed for 2 players since it's called Mario Bros. and not Mario Bro. With two players you can push each other into enemies and that's always good for a laugh. An alright game, but it's already been given out free so many times on the gameboy advance it's a bit of a waste to spend 500 points..
i got this for my gameboy so theres no reason for me to buy this but i gotta agree...multiplayer is the best aspect of the game. i don't think it's worth buying if you're not gonna do multiplayer. buy donkey kong of super mario bros. before this, they are better games. Daz, sorry to say this, but I think you under-rated the game. This game's a welcome addtion to anyone's library of VC games. It's pretty fun to play with a friend and in short bursts, but it won't last terribly long. Isn't worth the points, but the multiplayer is killer, just ridiculous. Play it in SMB3. I always enjoyed this game, even if it is a bit repetative. 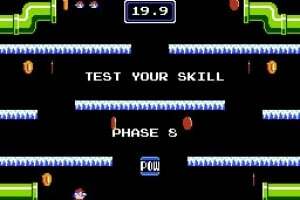 But It's still quite challenging to reach phase 99, or go for the highest score you can get in single player mode. 2 Players is fun to. If you never tire of somewhat repetative games, or enjoy arcade-like classics like Pac Man, and Joust, you'll like this. If you already own one of the GBA version though, (In one of the Super Mario Advance games) you might wanna save your Wii points & money. The GBA version is definatelly better, and plays better, unless you wish to expirience the 8-bit classic graphics & sounds. It's still fun to play either game, I feel. There seems to be a lot of miinformation going around - this game is NOT available for the GBA - remakes of it is. In those remakes, te engine hasbeen redesigned, with the biggest change being the ability to control your jump a lot better, something that really takes a lot away from the game. Would you like to play a racing game where you had absolute complete control of your ca at any given time, making skidding, braking, timing and such ompletely obsolete, as the carwould stay glued to the road and turn exactly as you wanted it to at any given time? No, where's te challenge in that? 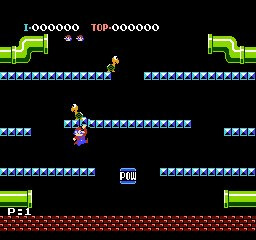 The NES Mario Bros, however, provides the PURE Mario Bros feeling - the way the game was meant to be played. You can't get this in any of the remakes, and for 5$, this one's a no-brainer. A fantastic 2-player game where layers may either help or hinder eachother, chasing after the highest score of the two, or the highest combind score of all time. Of course, the game can be played alone as well, but is nowhere near as fun like that. Mario's three original arcade games are some of the best games in thirrespective genres, and definitly not something to be missed. 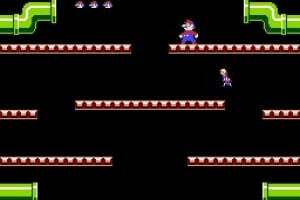 And remember, you can't get the real Mario Bros experience from the remakes. I love the GBA version of this, but I have yet to try this version. I plan on downloading it soon, because, at least to me, this game has a very good "high score drive." I have tried to get high scores on the GBA games, and I have fun with it. I recommend it unless you have completely worn it out on a Mario GBA game, the arcade, or any other medium. It's a fun little multiplayer romp, but it lacks the replay value or gameplay depth to warrant anything more than 2 stars. It's not a terrible game, it's just a product of an earlier, innocent age. This seems like it would be fun for some quick two player action. Very dated, but OK in 2 player mode... not really worth 500 points though. Ah! I downloaded this and love it! It is a great little game, and this version doesn't fail to feed my high score appetite. Download if you've got 500 points and nothing to do with them. Another update. I played the 2 player mode, and I must say, it is incredibly fun. 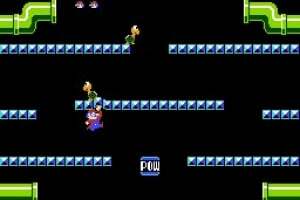 There are not many other experiences in gaming more satisfying than bouncing off of the head of your greedy brother attempting a robbery of your cash, be it Mario or Luigi, to get that hard-earned coin! Classic! The hectic play with two players is very fun and almost completely justifies the download, and does if added to my previous points. It's not worth it! Get a better version of it on a GBA game so you can at least get two games in one. The game isn't terrible but it isn't wonderful like some people have been saying it is. Again, if you want it, get it on the GBA. Better single-player, better co-op, better graphics, better everything. Nostalgia isn't even worth the five dollars. I have not downloaded this, but the next time my sister visits I will get it immediately. If you have memories of this game from back in the day (way back), it never gets old. If you want to play this game, then your best bet is to play it on the GBA that came with many Mario games. To recreate the experience of playing this game without spending points, wait for a rainy day and roll around in a big mud puddle. Then, get a friend in on the action by giving them a bear hug. That's about right. It really should'nt be 2 stars ⌐_⌐ it's a great game! Why get this when you can get SM3 (which has this as a minigame) for the same price? does Nintendo really expect us to download this when we have the graphically enhanced remake of the game with 4-player support included in 5 different GBA games? Just how dumb do they think we are?? This is a great game though, and an important one in Mario history. this version isn't very good (and a waste of points if you ask me. ), but I think it deserves at least 3 stars. I bought this game and loved it. I think if you like classic skill games That keep you reaching for the highest score please buy this! but if you are are a contemperary gamer who only cares about completion then dont rag on this game or others like because if its "dated" feel. and no im not like 40 years old im 17.
arcade style games are my favorites! 4 stars! king jiggle,i am 39 and im with you. excellent comment! And in Japan it was released as part of the "Famicom Mini/Classic NES Series" for GBA. And by the way, Tweek. The version in SMB3 isn't the complete Mario Bros. game. It onley lasts a few minutes, (and onley has one Mario Bros. level) and it doesn't have a single player mode. 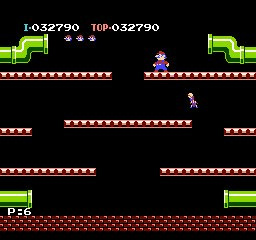 So you don't really get the actual full Mario Bros. game in SMB3, but a watered down mini-game version. Where would we be now if they hadnt had made this Classic ? how do u get this game on animal crossing. This is the first time I've ever had this game other than the GBA enhancement. It rocks! SSB Brawl partially convinced me to download it. It is so addictive! Okay, I'm surprised that this only got a four out of ten! What? That's absurd, this was one of the BEST game on the NES! Really crazy! It should have at least gotten an seven!